Peel avacados and mash. Squeeze juice from one lime and mix. Add some salt and pepper. Mix. Add all other ingredients and more salt and pepper. Mix. Taste. If it just doesn't taste quite right, then add more salt. Add more salt until it tastes amazing! Honestly it uses a lot of salt, so don't be shy. Enjoy! Then, after adding all the ingredients, blend the hummus until it is very smooth and creamy, usually about 5-7 minutes in the blender. Be sure to taste it as you go. You don't want the lemon to over power, or be over-powered. And you gotta use a good salt. When it's done, you can serve with a drizzle of olive oil and then a sprinkle of Paprika. Carefully split each pitas to form two circles. Heat a scant teaspoon of oil in a skillet (I used cast iron) over med high heat until the oil starts to smoke. (Be sure your kitchen is well-ventilated!) When the skillet is nice and hot, throw a pita in, "inside face" down. Check on it after a minute or two. It should get a little blackened. Flip over, and give the "outside face" a minute or two to char up. Remove from heat and drizzle a little more oil on the "inside face." (and sprinkle a little more oil on the skillet before frying next one.) Cut pitas into desired number of wedges. Sprinkle with caraway seed, if desired. I found this on Vera Bradley's website. 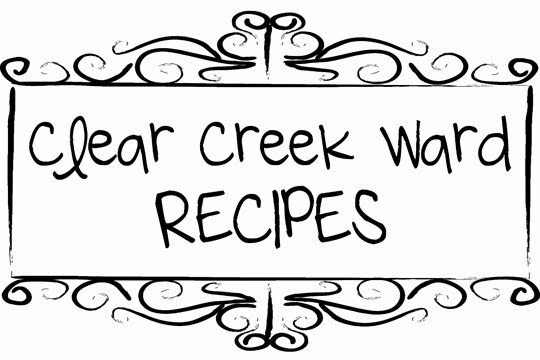 Very easy to make and works well to make ahead of time for an easy dinner. It is a yummy salad and goes great with Parmesan Breadsticks. Enjoy! Cook the pasta according to package directions. Drain. 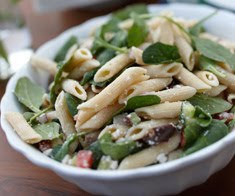 In a large bowl, combine pasta, spinach, onion, tomatoes, cucumbers, olives, feta cheese and Parmesan cheese. Mix well. In a small bowl, whisk the olive oil, vinegar, mustard, and Parmesan cheese. Pour vinaigrette over pasta salad and mix well. Add salt and pepper to taste.